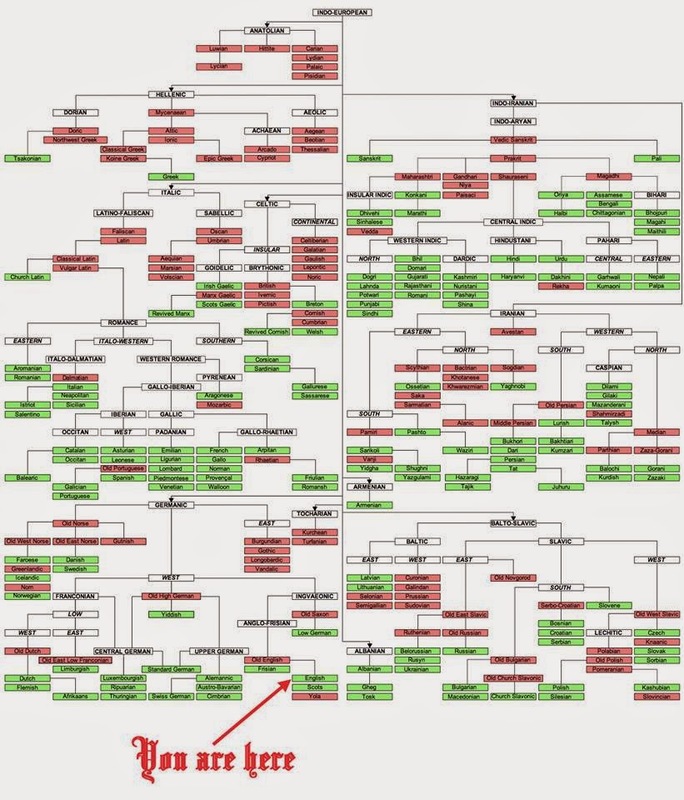 I've seen a number of good "language trees" over the years but the one on Wikipedia accompanying their Indo-European Languages entry is particularly good. Check it out full-sized here. The image above was humorously touched up a bit by someone on Facebook. While you don't necessarily need to make anything so elaborate for a tabletop RPG setting, would it be so wrong if you wanted to do so? I think not. In fact, if you have a world with many cultures and a rich history, it would be very useful to build one to aid in other creation projects. If a PC discovers a book, you have a ready way to place it in time and space based on the language being used in the text. Someone in-game might identify a weapon with particular runes as being from an ancient empire that was the progenitor of another, giving a clue as to where one might find out more or discover other related artifacts. An obscure link between two nations might be a way for the characters to prevent a war. The possibilities are endless, so have at it.